This course is to provide practical knowledge to new navigating watch keeping officers on the application of Collision Avoidance Regulations, to effectively manoeuvre the ship in heavy traffic areas and prevent close quarter situations and collisions. The navigating officer shall also gain confidence in keeping independent bridge watches. 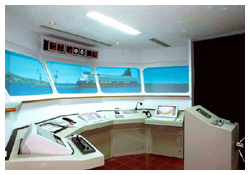 The Course is conducted on a Full Mission ship Handling Simulator, where the officer-on-watch navigates the ship through dense traffic areas of the world in good to poor weather conditions and restricted visibility. Be able to gain experience in handling ships in heavy traffic areas and to be more confident in keeping independent bridge watches. 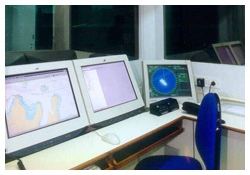 A greater understanding and awareness of efficient bridge procedures during watch keeping and ship handling. 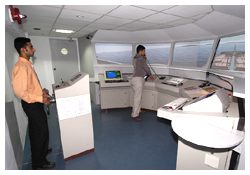 Familiarization with the ship's "Manoeuvring Data". Understand the importance of calling Master, well in time. Importance of Look out and Safe speed. Conduct of vessel in heavy traffic areas, Traffic Separation Scheme, Narrow Channels. and in restricted visibility. Understanding and practical application of International Regulations for Preventing Collisions at Sea, 1972. Good Bridge Team Management by the proper use of resources available on the bridge, viz charts, publications, radar, ARPA, GPS, VHF, AIS, auto-pilot, helmsman, etc.